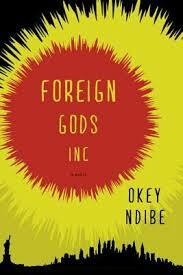 Okey Ndibe’s second novel Foreign Gods, Inc, is a curious tale about Ike, a Nigerian cab driver living in the US, who sets out to steal the statue of Ngene, an ancient war god from his home village to sell to a high-end art gallery in New York. Ike’s decision to steal a part of his cultural and spiritual heritage is driven by desperation. Despite being very well qualified, the corporate world is not receptive to him, citing his his African accent as a factor and as a result he’s unable to find a job in his chosen field, and ends up as a cab driver earning little to make ends meet, a fact that causes him great bitterness. On top of this he is financially crippled by an acrimonious divorce, not helped by his mounting gambling debts and the need to send money home to support his widowed mother. With all these financial pressures closing in on him, Ike comes to believe he has no choice but to steal the deity, and having done so his financial problems will be resolved and he will be able to live a fruitful and happy life. Although, it crosses his mind that what he is planning to do is unthinkable and can only cause him more troubles in the long run, Ike is still determined to go ahead believing it is the only way to solve his problems. The more bitter he becomes thinking about his life, the more convinced he is that Ngene is the answer. So back home to Nigeria he goes, to his home village which is divided along the spiritual lines of those who worship Ngene, of which Ike’s uncle is high priest and those who practice Christianity led by a power-hungry pastor who is more like a sleazy second-hand car salesman than a man of God. Here you find an interesting parallel being drawn against Ike’s arguably immoral decision to steal his village god and his mother’s pastor’s blatant salesman’s patter of a prosperity gospel in which he alone benefits from. Ike, obviously disgusted by the pastor’s behaviour and his manipulation of both his congregation and the gospel fails to see that they are in fact doing the same thing: selling religion for profit and likely for the same reasons. Who is worse: the one mis-selling the gospel to the impoverished masses or the one selling the village god to a museum? The more Ike tries to justify himself, the more you come to realise that it is not so much desperation driving him as it is a need to show himself more powerful and successful than he actually is and money is the expression of that success. There is much to be said about this novel. As with Arrows of Rain, Ndibe first novel, there are so many layers to the story that leave you pondering long after you have finished the novel. Well it did me! I liked the way that Ndibe skillfully unpacks the immigrant experience in present day America where being ‘other’, being ‘foreign’ can work for or against you. The very fact that there exists a museum dedicated to selling gods from around the world for princely sums, shows how just about anything can be commodified depending on what is currently in fashion. There is a scene where the museum owner explains to Ike the price range for selling various gods from around world and reveals that the prices for African god has decreased as they are no longer ‘in vogue’. As he pointed to a range of African deities gathering dust on a shelf, I wondered if this was also a commentary on how one can forget one’s past, heritage and cultural values and leave them behind to collect dust in the background of memory in order pursue a false promise of that which glitters. But as the Bible says, ‘what does does it profit a man to gain the whole world, yet lose his soul’. After all is said and done some things are too valuable and too precious to ever be sold. Posted on 19 January 2014 5 March 2018 by queenpea77Posted in ReviewsTagged African literature, books, fiction, identity, just-read, religion, reviews.